One-year-old Patience Medab died this date, August 30th, in 1849 and was buried at Bethel Burying Ground. Fourteen-month-old Patience Medab* died this date, August 30th, in 1849, of a respiratory infection and was buried at Bethel Burying Ground (BBG). Her parents were Mary, thirty-two-years-old, and George, thirty-nine-years-old. Both were born in Virginia, according to the 1850 Federal Census. He was employed as a shoemaker and Ms. Medab as a laundress. It appears the family tragically lost another daughter, two-year-old Elizabeth, in September of 1847. She also was buried at BBG. Sixty-eight-year-old Patience Medab, whom I believe was the baby’s namesake and paternal grandmother, died from complications of a stroke in April in 1843 and was buried at BBG. The Medab family lived in a 10’x10′ room at 41 Quince Street for which they paid $4 a month. Mr. and Ms. Medab attended church services, belonged to a beneficial society and claimed to own only $100 in personal property, according to the 1847 Philadelphia African American Census. The Medad family lived on Quince Street between Spruce and Locust Streets and 11th and 12th Streets. In 1847, there were forty-two Black families on the busy street that had a total of ninety-two family members including the Medads. Shoemaking was a skill that enslaved Black men were allowed to learn and practice on plantations in the North and South. It was also a trade that could be easily passed down from father to son. According to city directories, Quince Street was home to several Black men who reported their occupation as shoemaking. It was faster to learn than other occupations such as clockmaking or silversmithing and the tools necessary were relatively inexpensive. However, the cost of establishing a shop, purchasing leather, and waiting to establish the clientele while maintaining a family at the same time was beyond the reach of most Black men in Philadelphia during the 1840s. Therefore, most Black shoemakers did “piece work” and they only were paid for making one pair of boots or shoes at a time. Fourteen-month-old Patience Medab was laid to rest in the family plot on a day when the morning was covered in a “dense fog” that eventually burned off to become a “warm and sultry” afternoon with the temperature reaching 82 degrees. Frances Wilson gave birth to a stillborn male child on this date, August 29th, in 1845 and the child was buried at Bethel Burying Ground. Frances Wilson delivered a stillborn male child on August 29th in 1845. The child subsequently was buried at Bethel Burying Ground (BBG). Tragically, Ms. Wilson delivered a stillborn female child on July 14, 1843, who also was buried at BBG and, on New Year’s Eve in 1848, she lost a three-day-old son who was interred at BBG as well. All the babies would have been buried in the same grave. In 1845, Frances was twenty years old and married to Albert Wilson, age unknown. They had three children, Iram (5), Albert (3), and George (1). In 1847, Frances would give birth to another son, Charles, according to the 1850 Federal Census. Albert Wilson was employed as a coachman, according to a city directory. It is unknown if he was a public driver, similar to a taxi cab driver of today, or if he worked for a single family. Mr. Wilson disappears from public records in 1849. His spouse, Frances, is listed as the head of the family in the 1850 Federal Census. There is no death certificate for Mr. Wilson in the existing records. He may be buried with his children at Bethel Burying Ground. There is, however, an item in a local paper in 1847 that suggests that Mr. Wilson lost his coachman job and was looking for a career that offered more opportunities. The address and age in the advertisement match Mr. Wilson’s. It appears that the Wilson’s owned their home at 14 Buckley Street. It was sold in 1855. I was unable to find any additional records on the family. The Wilsons buried their stillborn son on a clear day in August that only reached a high of 68 degrees. Fifty-year-old Moses Blake died this date, August 24th, in 1848 and was buried at Bethel Burying Ground. Fifty-year-old Moses Blake died this date, August 24th, in 1848 of “Fever” and was buried at Bethel Burying Ground. Mr. Blake, along with his unnamed spouse, was born enslaved. One had their freedom purchased for $25 and the other was manumitted by his or her enslaver, Richard Baker of Maryland. The 1847 African American Census also reports that the Blakes had three children between the ages of five and fifteen. They attended church services regularly and belonged to at least one beneficial society. The Blake family lived on Bedford Street, a narrow block long thoroughfare that was where many white Philadelphians believed the devil lived. White and Black men and women were seen “unhesitatingly” mixing and even were rumored to be legally married to each other. Blacks saw Bedford Street as a slum where corpses laid unburied for days, waiting to be picked up and dropped off at the city’s Potter’s Field. Consequently, the neighborhood was a target for church missions, schools, and soup kitchens, not only because of the local desperately poor but also for the presence of gambling dens, houses of prostitution and speakeasies. Violence and disease were constant visitors. No one chose to live on Bedford Street but that was all they could afford and was likely close to Mr. Blake’s workplace. The 10’x10′ room the Blake family resided in cost them $2.50 a month. Mr. Blake worked as a laborer and Ms. Blake was occupied as a laundress/day worker. Two of the children attended the Bedford Street Mission School. Bedford Street, now Kater Street, was home to sixty-three African American families according to the 1847 Philadelphia African American Census. Ms. Blake and her children buried their spouse and father on a clear day in August with the temperature rising to only seventy-eight degrees. Forty-nine-year-old Sarah Darrah died this date, August 23rd, in 1850 and was buried at Bethel Burying Ground. Forty-nine-year-old Sarah Darrah died this date, August 23rd, in 1850 of Apoplexy (stroke) and was buried at Bethel Burying Ground. She lived with an older woman who was crippled from strokes and relied on Ms. Darrah as a caregiver, according to the 1847 Philadelphia African American Census. Ms. Darrah was born in Delaware and earned a living as a laundress in 1847 and a “whitewasher” or house painter at the time of her death in 1850. She had lived in Philadelphia for approximately thirty years. Ms. Darrah was a widow. Census records identify her deceased spouse as Tilghman Darrah who worked as a porter. The 1840 Federal Census reports that they had a daughter who was between 5-10 years of age. There are no city death records available for either individual. One or both may have been buried at Bethel Burying Ground. Ms. Darrah lived in a single small room at 70 Union Street, now Delancy Street, with her roommate for which they paid $1.25 a month. The physically disabled woman, for whom Ms. Darrah was caring, was receiving public aid that included some firewood in the winter and a small amount of groceries, according to the 1847 census. Ms. Darrah was a long time member of Bethel AME Church and belonged to a beneficial society that may have paid her burial expenses. 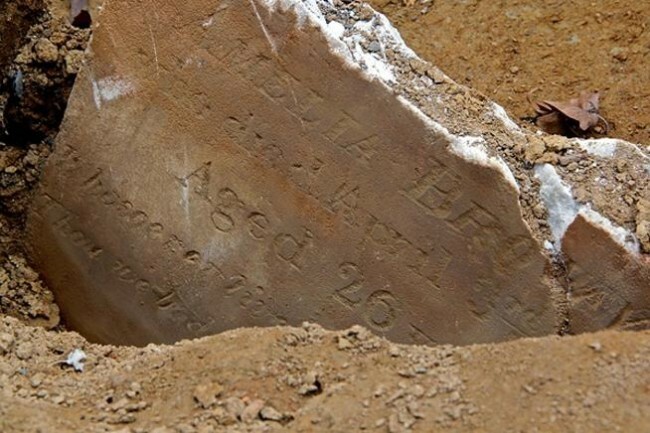 She was interred on a clear August day where the temperature reached a high of seventy-eight degrees by 3 p.m.
Ten-month-old Deanna Smith died this date, August 13th, in 1836 and was buried at Bethel Burying Ground. Ten-month-old Deanna Smith died this date, August 13th, in 1836 of Cholera Infantum and was buried at Bethel Burying Ground. She was a victim of a bacterial disease that, although its symptoms mirrored adult Asiatic Cholera, was of an entirely different etiology. Little Deanna would have come down with a fever closely followed by vomiting, constant diarrhea, eventual convulsions, severe dehydration, rapid emaciation and finally death from one to four days after the initial onset. Physicians would have little to offer their patients. Not all babies that came down with the disease died from it. However, given how young this child was, it was inevitable. Today, a simple course of antibiotics and Pedialyte would be all that is needed to restore the infant to health. The identification of the child’s family is problematical. The slim evidence available points to George Smith being Deanna Smith’s father. The 1837 Philadelphia African American Census did not record the mother’s name. He worked as a laborer while his spouse was employed as a day worker. There appears to have been at least one other child in the family in addition to Deanna. The severity of the family’s poverty was evident in the census report that states they only had $10 in personal property. They lived in one room on the 700 block of Shippen Street, now Bainbridge Street. For this, they paid $3.16 a month in rent. In July of 1835, the Smiths would have been in the path of a marauding white mob numbering over a thousand. They attacked Black men, women, and children as they sacked and burned homes and churches only a couple blocks from the Smith’s home. There was a group of 50-60 African Americans who were armed and who attacked the mob guerilla style throughout the days and nights, as the police looked on and did nothing to protect Black citizens. Deanna’s mother may have been one of the many Black women who struggled to gather up their children and escape the mob. Some hid in pitch black cellars, while others left the city taking the ferry to Camden, New Jersey. The Smith family buried their daughter on a relatively cool day in August where the temperature reached only 73 degrees by 3 o’clock in the afternoon. Deanna was one of 212 children in Philadelphia that died of Cholera Infantum in 1836. The twenty-two-month-old son of Elias and Marsha Collins died this date, August 10th, in 1848 and was buried at Bethel Burying Ground. The twenty-two-month-old son of Elias and Marsha Collins died August 10th in 1848 of Tabes Mesenteria and was buried at Bethel Burying Ground. The infant’s name was not recorded. The cause of death was a disease of children which was caused by drinking milk from cows infected with a certain form of bacteria. The disease painfully destroys the lining of the stomach and results in rapid weight loss and death. With pasteurization, it is no longer a major problem. The unnamed toddler was the only child of Elias (36 years) and Marsha (22 years) Collins, according to the 1847 Philadelphia African American Census. The couple had a 50-year-old woman, Caster Dumfries, residing with them. All were born in Virginia, according to the 1850 Federal Census. Ms. Dunfries may have been Ms. Collins’ mother. Elias Collins was employed as a laborer and Marsha Collins as a laundress. The three adults and the baby lived in an 11’x11′ room on White’s Court for which they paid $1.67 a month. The above photo is how White’s Court (renamed Addison) looks like currently. On this narrow alley, near 10th and Lombard Streets, the Collins’ were one of 25 families totaling 92 residents. They labored at jobs such as shoemaker, tailor, dressmaker, laundress, and waiter. Around the corner was the Shiloh Baptist Infant School that provided daycare for the families. It is likely that Baby Collins was enrolled there before his death. In Philadelphia, the Collins’ son was one of forty-six children who died of Tabes Mesenteria in 1848, according to official Board of Health records. Seventy-four-year-old Ann Fletcher died this date, August 8th, in 1849 and was buried at Bethel Burying Ground. Seventy-four-year-old Ann Fletcher died this date, August 8th, in 1849, of Dysentery and was buried at Bethel Burying Ground. She resided with another elderly woman at #6 Little Pine Street in one room for which they paid $5 a month rent. Neither woman was born in Pennsylvania. According to the 1847 Philadelphia African American Census, Ms. Fletcher was working as a laundress. The red arrow indicates the approximate residence of Ms. Fletcher. As a member of the Bethel Church congregation, Ms. Fletcher was witness to many seminal events in the Church’s history, such as the visit of the former slave and abolitionist Frederick Douglass. She may have been one of the thousand mourners who attended the funeral of her longtime pastor, the Rev. John Boggs. If her health was good enough, she may have joined the long procession to Bethel Burying Ground to inter the beloved minister in May of 1848. Shortly before her death, Ms. Fletcher may have witnessed the funeral of Bishop Morris Brown, who was the successor to the AME Church founder Richard Allen. She may have been able to look out her window on May 14, 1849 and see a large number of mourners in front of the Church where the elders were lowering Bishop Brown’s coffin into the vault where Bishop Allen’s remains also were situated. It was an end of an era. Ms. Fletcher would make her own journey to Bethel Burying Ground two months later. The God of Bethel heard.